HAMPSHIRE continue on the road to Twickenham against Somerset with a Bill Beaumont County Championship game at Taunton. 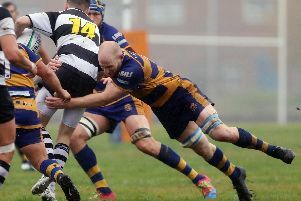 A buoyant Hampshire opened their campaign with an impressive 56-35 home win over North Midlands. Ian Chandler’s side are aiming to make it a hat-trick of Twickenham appearances in successive years. The senior coach, however, is expecting a stern test from the hosts, who lost to Warwickshire in their opening game. That defeat, he believes, will make his side’s task harder. ‘Somerset will be smarting from their defeat and will want to put things right,’ said Chandler. ‘We believe they also have a number of their National Two players available. ‘Once again we are expecting to face a very physical challenge up front. ‘They also possess some very direct running backs. ‘Like we did against North Midlands, we will have to try and negate their strengths. ‘That was something we did well in our first game. ‘Our aim will be to move their big pack of forwards around the pitch. Hampshire are forced to make a number of changes through unavailability and injury. In the forwards, the experienced figure of Ali Ramus (Tottonians) comes into the second row to replace the unavailable Harrison Young. At number eight, Joe Davis comes in for the injured Liam Perkins. There are also changes in the three-quarters. Curtis Barnes and Robbie Searle were injured in the opening game. Scott Morris (Havant) and James Wise (Leicester Lions) are drafted in. Ritchie Buck (Tottonians) comes in for the unavailable Grant Hancox in the centre. Chandler regards the battle for supremacy in the forwards will play a big part in deciding the result. ‘We will have to be strong up front,’ said Chandler. ‘This is where the game will be won or lost. ‘It is good that we have been able to bring Ali Ramus in.